While walking casually in Connaught Place, I was struck by a curious sight. 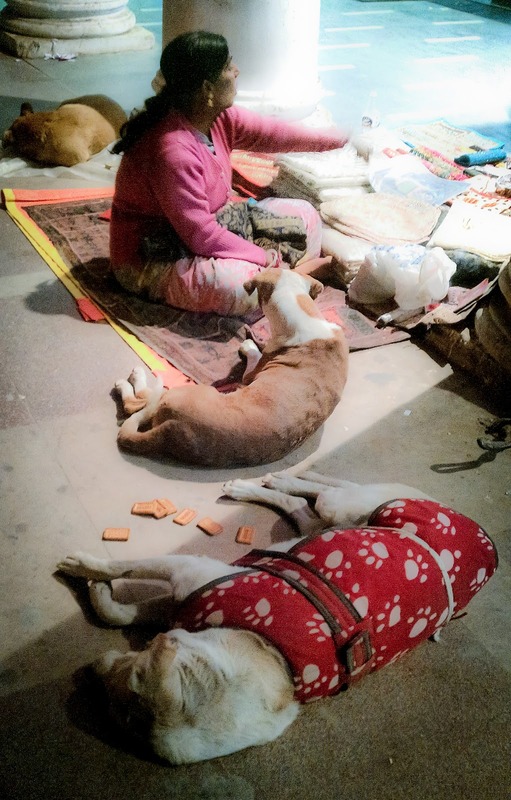 A woman manning one of the roadside stalls was engrossed in her business while two stray dogs were patrolling the area around her. After a while, the dogs took their positions around the stall, curled up, and dozed off. Soon more dogs arrived and joined the sleep-over. The woman, all the while, was apparently unperturbed by the increasing canine presence around her and went on haggling with the customer who was inspecting a colourful patchwork rug that her stall apparently specialized in. As soon as the customer walked away with the rug and the woman pocketed the money, the ears of the apparently sleeping dogs twitched and soon they were looking up at her. She reached inside a polybag that was lying next to her and took out an unopened packet of biscuits. And threw one biscuit at a time at the dogs. The dogs swiftly gulped down their share and gave her that persistent pleading looks only dogs are capable of. She distributed another round of biscuits. Absent-mindedly she reached out and petted the nearest dog. 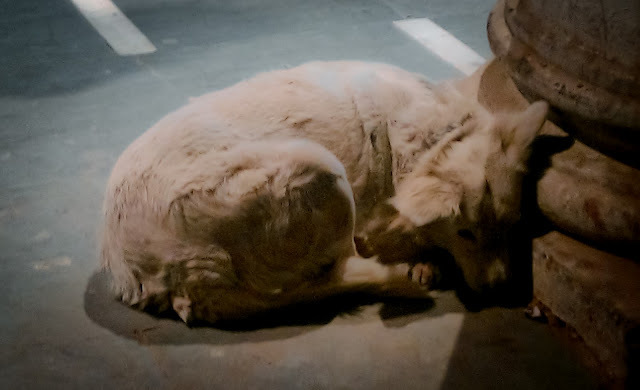 In exchange, the dog lay down and kept its head in her lap. By now, I knew that this roadside vendor had to be the next candidate for "Meet the Street". Upon talking to her I found out that her name is Manisha and she travels to Connaught Place every day from Rohini. 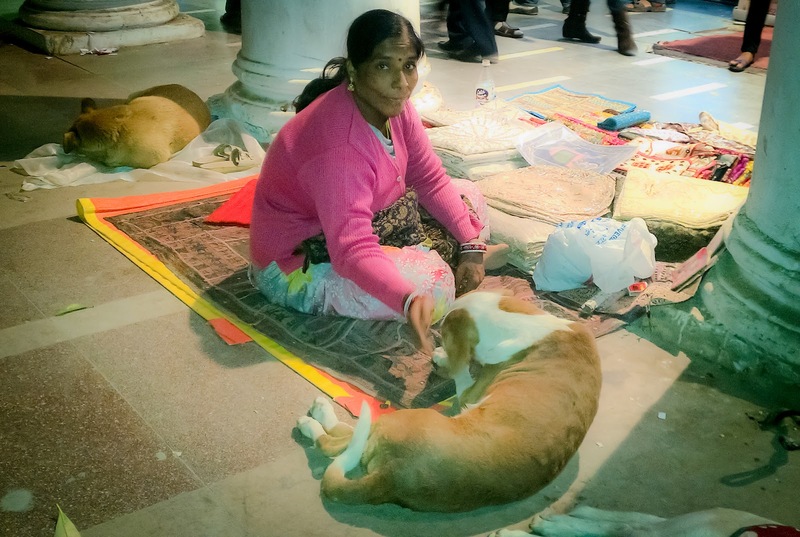 She has been manning the stall now for more than 10 years and ever since she started coming here, she started adopting the street dogs. Or you can say that the dogs adopted her. Every day without fail, she brings biscuits and other goodies for her canine friends and that is enough for them to stay rooted to the spot. As you can see, the dogs seem well-taken-care-of. I asked her the names of all the dogs and they had the usual doggy names, such as Moti, Sheru, Jimmy...I pointed at one particular pomeranian curled up in a corner. "She's Jeevika." Manisha replied. I was surprised because I was expecting a "Lucy". I asked her the reason for this name. "When she came to me, she was tiny and barely alive. She was sick for a really long time. I wasn't hopeful of her survival. But she made it!" 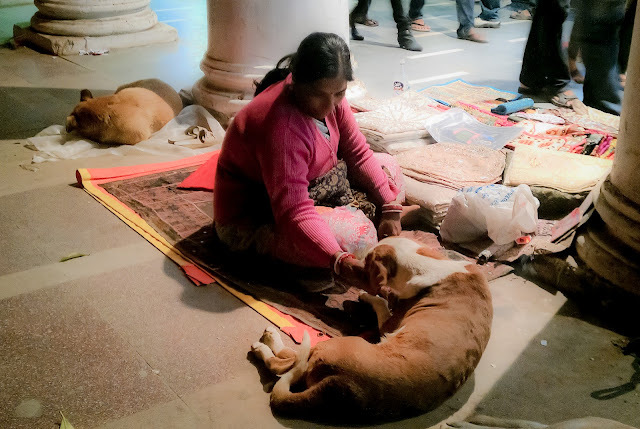 Till now, I was intrigued by this woman's affection for the dogs but now I was touched. I love dogs and have always wanted to keep one as a pet but have never found myself in a suitable situation. But looking at this woman, it was clear that you don't need to keep a pet in order to love a dog or to receive love from it in return.